Admit card will be available four days before the date of examination. Latest news (04.03.2019) - RRB Group D Result will be declared after 03:00 pm on official website. The official result for Railway Group D will be available on 13th February 2019. The rest of the candidates shortlisted for slow 3 examination which will be organised after 28th October 2018. The candidates who have been shortlisted for float 3 examination check the exam date after 18th October 2018 on the official website. The link to check their admit card, exam date, railway pass has been provided in the end of the age. The good news is that railway Recruitment Board has uploaded online application form for the post of group D for seconds slot candidates in official website. The candidates are advised to check their registration number in order to know their exam City and exam date whether they have been shortlisted for 2nd floor examination which has been scheduled to be held from 7th October 2018 to 28 October 2018 at various exam centre across the country. The candidates are suggested to bring two pages of admit card along with original photo ID proof for examination centre. The first page of admit card will be cut at half and delivered to the candidate stamping accepted on the admit card page. Latest News on 05.10.2018 - The new exam date has been scheduled for the second slot candidates and RRB Group D admit card will be live on 18th October 2018. "Dear Candidate, The Exam City and Date information is live for candidates scheduled till 26.10.2018 only. Your exam is scheduled after 28th October 2018 and the exam details for you will be live on 18-10-2018." Latest News (28th September 2018) - RRB Group D Exam City & Exam Centres will be available in the first week of October 2018. Admit Card will be available about 4-days prior to the exam date for Slot II (Those who have been shortlisted for the exam to be held after 16th October 2018). It is also predicted that RRB will continue the process Slot III and the candidates may get a new date of examination after 16th October 2018. These candidates may be called for appearing in the examination in Slot III. RRB may take Slot III in the month of November 2018. Latest news on 26th September 2018 - Railway group D admit card for second slot will be available in the month of October After 16 for those candidates who have been found eligible for the slot 2 examination. The latest information is that those candidates who have not even know there exam city and exam date, their exam city and exam date may be available around 30 September 2018 on official website. On 22.09.2018 -Railway Group D Exam City, Date and Shift for remaining candidates will be available on 30th September 2018 on official website. False video - Candidates may please note that the video circulating on social media about an examination in Bhagalpur centre of Bihar does not pertain to RRB Group D Exam. RRB conducts exam in a secure, professional and transparent Manner. Do not get misguided by any such misinformation on social media and rely only on information published on the official websites of RRBs. On 18.09.2018 - Railway Group D Call Letter for Exam to be held on 18th, 19th & 20th September 2018 will be sent through email ID to the candidates. "Dear Candidate, The Exam City and Date information is live for candidates scheduled from 17.09.2018 to 16.10.2018 only. Your exam is scheduled after 16th October 2018 and the exam details for you will be live from 13.09.2018 onward." On 09th September 2018 - Railway RRB Group D Exam Centre and Exam City has been available now. Check the details by using registration number and DOB (as password). NOTE : THIS INTIMATION DOES NOT PERMIT YOU TO APPEAR IN THE EXAMINATION. THIS IS JUST TO INFORM YOU ABOUT YOUR EXAM DATE AND CITY AND ENABLE YOU TO MAKE TRAVEL ARRANGEMENTS. नोट : यह सूचना परीक्षा में बैठने के लिए अनुमति नहीं है। यह केवल आपको परीक्षा शहर एवं दिनांक की जानकारी देने और यात्रा व्यवस्था के लिए है।. 1.यह सूचना आपका ई - कॉल लेटर नहीं है और यह आपको परीक्षा में बैठने की अनुमति नहीं देती है। यह केवल आपकी परीक्षा शहर एवं दिनांक की जानकारी और यात्रा व्यवस्था के लिए है।. 2.आप अपने संदर्भ के लिए इस सूचना को डाउनलोड और मुद्रित कर सकते हैं।. Latest news on 1st September 2018 railway group D admit card will be start distributing from 7th September 2018 according to the sources the news is that railway recruitment board is going to distribute online admit card from 7th September 2018 onwards for group D exam held after 17th September 2018 at various exam centre across the country. The online Computer Based test will be conducted and alphabetically roll number will be distributed to the candidates. You are advised to keep visiting the official website regularly to get authentic information about the railway group D admit card 2018 the link for official website of railway RRB group D has been provided on the table given in the end. 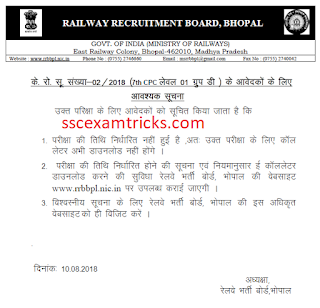 Latest news on 31st August 2018 railway group D admit card may be available on 10th September 2018 for the examination scheduled to be held from 17th September 2018. The candidates can download the exam centre and date of examination on 10 September 2018 dialogue in their account on the official website. According to the official notice released by the railway for group D examination is that RRB group D exam for Computer Based test for recruitment of Level 1 posts is likely to be start from 17th September 2018 the exam date city and shift details shall be made live 10 days prior to the start of Computer Based test the detail CBT schedule shall be released shortly. According to the news from resources Railway Recruitment Board is under the process of scrutiny of application form submitted by the candidate for the post of group D on official website. Now a day candidates are waiting for RRB group D admit card which may be available very shortly on official website. According to the official notice available on RRB website railway group D is in final stage and is likely to be completed scrutiny of application form in the month of July 2018. Thereafter RRB group D application status can be checked on the official website. The Computer Based written test for group D level 1 post is likely to be start in the month of September October 2018. the exact date of exam will be advised from arbys website in due course. The candidates are advised to visit the official website of RRB regularly for getting latest update and not to get mislead unauthorised news post circulated in media or social media the website link for RRB are discussed in this page for various zones. It is claimed by many websites on the internet that the railway group D exam will be organised alphabetically and will be started from 12th August 2018. No admit card have been generated till 12th August 2018 and no news his own internet about the release of railway group D exam date and release date of admit card. Many newspapers have claimed that online admit card will be sent through email ID of the registered candidate for the 90000 post of group D.
The written test will be held in September to December 2018. The exam date may be announced in the first or last week of August 2018. The written test will be closed in the month of December 2018. Railway Group D exam result will be announced before the commencement lok Sabha election. Railway Board is under preparation to complete this task so I can say that the previous exam date has been postponed. It is also in news that the result of exam held in the month of September to December 2018 will be announced within a. of 32 after the exam date. Nobody railway recruitment Board is under process in hiring agencies to conduct the online examination successfully across the country. The news regarding railway Group D exam date will be uploaded very soon. Besides that the good news is that Railway Recruitment Board has increased vacancies of RRB loco pilot and technician from 26000 to 60000. According to the notice uploaded by railway recruitment board Bhopal under Government of India Ministry of Railway, the exam for group D level 1 7th CPC advertisement 02/2018 has not been decided yet. So no admit card can be downloaded from regional website for the post of group D.
The online admit card for RRB group D will be uploaded on official website www.rrbbpl.nic.in. In order to download admit card you are advised to visit the official website as provided on above. On 31.07.2018 - RRB Group D Exam centre will be given around 200kms for 71% candidates. The good news is that those candidates who have uploaded wrong photograph, no upload of photograph or any other reason for RRB rejection of application form can uploaded their photograph from 19.07.2018 to 20.07.2018. For editing in photo upload, the candidates will have to pay fee for editing application form. No further change will be allowed and application will be liable to be rejected. The good news is that Railway Group D Exam Date has been scheduled from 12th August to 16 September 2018. Railway Group D Admit Card will be available about 10 days before the date of examination. The written test will be organized in five stages in which candidates are invited to attend the examination according to the alphabets of their names. Earlier RRB had notified for recruitment of 62907 posts of Group D and about two crore applications had been received by the board. RRB needed a little more time to organized the examination and finally, the news came as the date has been announced. RRB Group D Admit Card 2018 Chandigarh Kolkata Ajmer Bhopal Guwahati Ranch Bengalore Allahabad regions are discussed here. Earlier Railway Recruitment Board has notified for recruitment of 90000 Post for Group C and group D. Besides that railway may announce RPF Constable in the month of April / May 2018. Railway Group D exam date admit card date - The predictable exam date along with admit card date has been provided here. However no source for information provided on the official website. Please confirm the exam date and admit card date with the official notification provided by the Railway Recruitment Board. ((The exam date provided by Whatsapp Groups are discussed here for the purpose to prepare for the examination). RRB Group D Exam Date - The exam date and admit card date may or may not be considered with the original date of examination for RRB group D exam 2018.